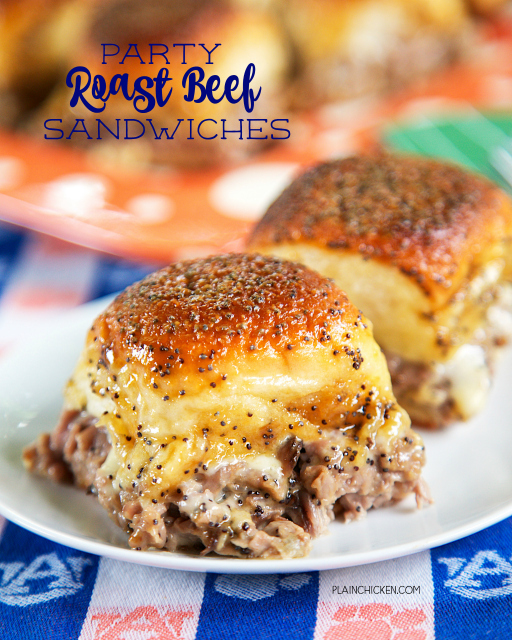 Party Roast Beef Sandwiches - CRAZY good! We are totally addicted to these sandwiches!! 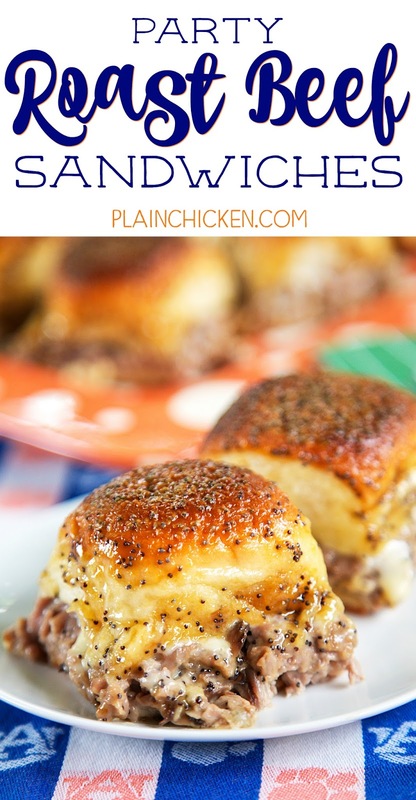 Hawaiian rolls, roast beef, white american cheese, topped with butter, brown sugar, horseradish sauce, worcestershire sauce and poppy seeds. These things go fast! I always double the recipe. They are also good reheated! New favorite alert! 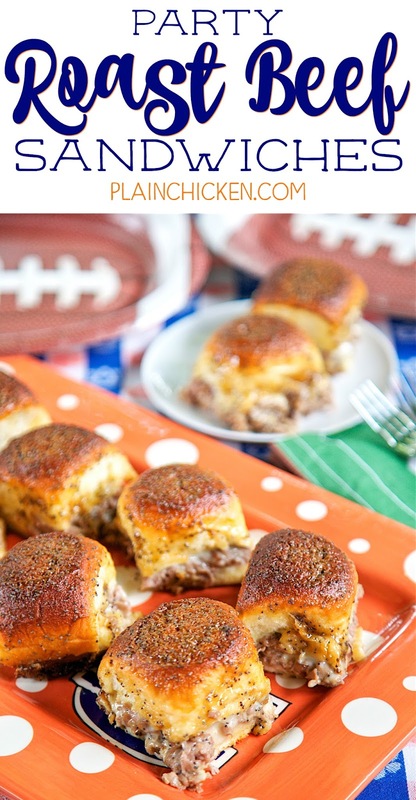 These Party Roast Beef Sandwiches are AMAZING! I absolutely love every single thing about these sandwiches! I love a good roast beef sandwich and these roast beef sandwiches are THE BEST. The meat, melty cheese and the sweet and savory sauce on top - perfection! The key to these sandwiches is using white American cheese. It melts perfectly. You just can't get other cheeses to melt like American cheese. The sauce has a little kick from some creamy horseradish. SO good. These are perfect for a party. They also reheat beautifully. We had these for lunch two days in a row. I wrapped the leftovers in foil and reheated them for a few minutes in the oven. Just as good as the first time we ate them. I LOVE these sandwiches. 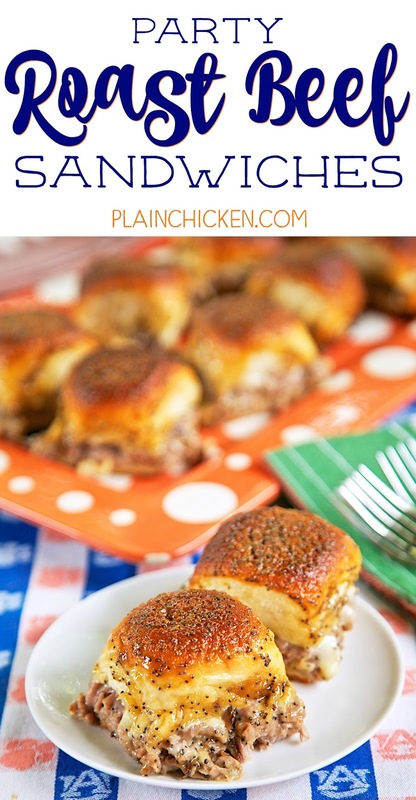 Make them for a quick lunch, dinner or tailgate! You won't regret it! Split each dinner roll. Spread a small amount of creamy horseradish sauce on the bottom of each roll. 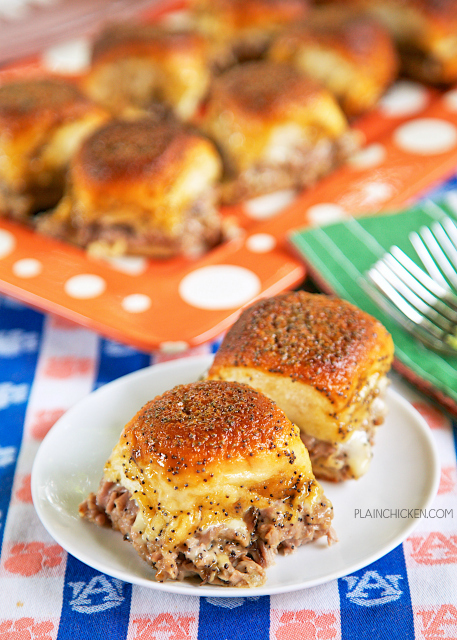 Make a sandwich of the roast beef and cheese and the dinner rolls. Arrange the sandwiches in a 9x13 pan. In a small sauce pan combine butter, brown sugar, 1 Tbps horseradish sauce, Worcestershire and poppy seeds. Bring to a boil and pour over sandwiches. Thanks for correcting the recipe, although I think we got the gist!! lol!! I make something like this using leftover roast I cooked in the crock pot. They are delicious so I know these must be as well. the ad won't allow your horseradish to show. Can you correct this? thanks. highlighted horseradish sauce, I meant to say. Made these sandwiches ... so good! The only change to the recipe is that I mixed the horseradish cream with the butter, brown sugar, and Worcestershire sauce. I think that this recipe should be in your "Crack" recipe section because it is so "of-the-hook" good. How would you recommend making these ahead? I'd need to make three batches for our party. Thanks! You can bake them, cover and then refrigerate them. I would cover them with foil and just reheat them in the oven when you are ready to serve them. These don't get soggy do they? These look and sound amazing! Definitely going on my menu for our next get together! I would love to try these, they look so good! But I'm Canadian and we can't get Hawaiian rolls or American cheese here. I'm sure I can find a substitute for the rolls but the cheese will be more difficult. Perhaps just a mix of Cheddar and Mozzarella? Any cheese would work fine. Enjoy!